Which green creature do you prefer: Goblins or Martians? We know it's a hard decision. That's why you don't have to make it. Whichever you choose, we've got something you'll love coming out this holiday season. One choice features an obnoxious number of Goblins; the other comes with invasive levels of Martians. Look for both new releases at your friendly local game store around the time you should be buying people holiday gifts! Speaking of which, here's a friendly reminder: All your friends love Goblins and Martians. That's right. We've just solved all your gift-buying woes. Why be a little excessive when you can be . . . Truly Gobnoxious? This booster pack has ten goblin monster cards, just to make sure your game features true hordes of enemies. You know, the way all good fantasy adventures do. There's also a handful of cards thrown in to help you fight the goblins, because winning is also important when you're trying to live out a good fantasy adventure. 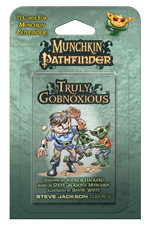 Munchkin Pathfinder: Truly Gobnoxious shuffles right into Munchkin Pathfinder or classic fantasy Munchkin. The art is by Shane White, a comic and game artist known in part for Pathfinder: Goblins!, Bad Karma, and Comic Book Tattoo. White also illustrated Munchkin Pathfinder: Guest Artist Edition, due out in October. Combine the two for an epic quest in path-finding and goblin-fighting! It could have been the end of the world . . .
Saucers descended from the skies, releasing unstoppable waves of robots, giant insects, and blaster-wielding soldiers. The armies of earth didn't stand a chance. All would have been lost were it not for the scientists of the Novas Vira, who saw the invasion coming. These men and women turned to science to create weapons and inventions powerful enough to defend earth from the Martians. It's a war of technology, where bigger and better vehicles, guns, and weapons win the day. Play as either the invaders or the human defenders. There are even rules for Martian space ships! 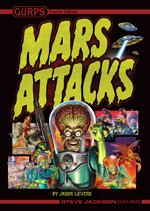 GURPS Mars Attacks is a GURPS Fourth Edition book. It requires the two-book GURPS Basic Set to play.